Feeling in good shape? Me too. Funny, but this morning my knees don’t feel as bad as yesterday. The crystal clear tap water tastes even better, my porridge wasn’t as chewy, and the air feels clean. Oh how good it is when your team wins. Let’s get the obvious stuff out the way first. Jonny Gray and Grant Gilchrist had superb games in the second row as Scotland came from behind to sink France at Murrayfield. It wasn’t only what they did in tandem – one offload from Gray to his partner in the lead up to the Sean Maitland try was extraordinary – but in what they did individually in open field running and generally smashing things up. Peter Horne likewise had the drive and bite needed in a team getting back to winning ways. Man-of-the-match Greig Laidlaw provided an over arching calm and assurance. And Simon Berghan blossomed the longer the game went on. David Denton is one of the answers to a question I sometimes ask myself which is: “Who are the muckle number eights who within the last couple of years seemed first choice for Scotland but have been posted missing for some reason?” The other answer is Josh Strauss. Denton came on and made an impact. Ryan Wilson had a quiet first half but when he goes to work, he goes to work, and Wilson clocked in after forty minutes. To win rugby games you need (at least) parity up front, and Scotland had that. 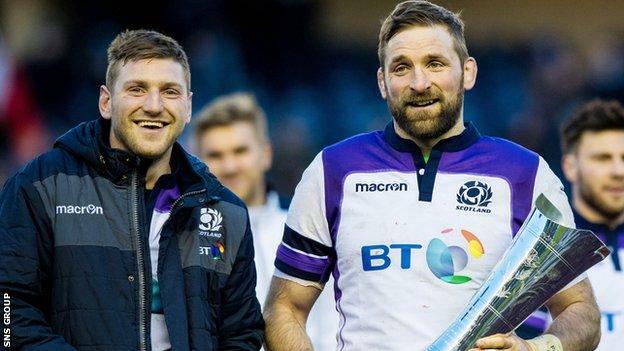 And, again stating the obvious, it’s a wee nod of approval to head coach Gregor Townsend who made a substitution that few would have predicted; ejecting Finn Russell from the pitch to move Laidlaw to stand-off. Who saw that coming? Nobody. Before we touch on the key to Scotland’s success a word on France. French rugby players are outrageously out of condition when compared to the other top class countries. Their Top 14 can be over reliant on a kicking and mauling game allied to a player-buying culture equating value with sheer size. The French have lost their first two games in the Six Nations for the first time since 2013 and both matches have slipped away from them with good reason. It’s sad to see a French team trying to slow the game down. There is speed and ability with the likes of Teddy Thomas on the wing, centre Geoffrey Doumayrou, and the ever-present Yacouba Camara at wing forward. But the longer the game went on, the less we saw of them, and the less we saw of the “S” word that is worth mentioning now. Arguably, the most important piece of any team’s armoury is its shape. Every player reading this knows that the proof of structure is that if there were no shape at all, then thirty players would be gathered within an arm’s length of the ball; like a school of dolphins hunting the last sardine. Shape is the pre-ordained position of every player relative to the ball at any one time given the position on the pitch. Every team has a shape. Shape wins ground. Shape breeds confidence and peace of mind. Team structure wins matches. Townsend has his game shape with, at its heart, pods of three forward running onto a long pass from the scrum-half or stand-off to truck the ball up and then allow the team to get the ball into space from there. Get it wide and repeat. Repeat very, very quickly. In the opposition 22 it’s a one pass shape until the stand-off spots width and calls for it. And where am I going from this? Well, the Welsh, in their first try last week, read that shape. Ali Price looked to pass long to his left from the right touchline to Jamie Bhatti, the middle man of three forwards, but Gareth Davies, the Wales scrum-half, had been given permission to read the pass. He intercepted. He ran the length to score. Heads went down. The Welsh had read the structure. But calamity in Cardiff metamorphosed pragmatically into maturity at Murrayfield. Scotland tweaked their shape. While the Scottish analysis teams will have looked out videos of every player they would compete against, so the French analysis team would have been presenting their coaches with a document named “Le attacking shape de les Ecossais” or something similar. Rugby is chess with thuggery, so, while the basic shape continued, the edges were blurred to catch the French unawares. Huw Jones scored his try by running an out-to-in line close to the ruck, the first forward receiver of the aforementioned long pass from scrum-half would pass the ball to his fellow forward in the pod of three to shift the target area, more offloading in close contact was permitted, and the inside ball from the first receiver back inside to a runner kept the French defence honest. Scotland punched a bit narrower to the breakdown at times. It was good to watch. It doesn’t seem much in isolation, but when you know what you are supposed to do and you do it quickly, and you are organised, and it is slightly different from what the opposition expects from analysing you, it works. Anyway, life will be sweet for two weeks. But hang on. The English will be analysing Scotland’s shape, the Scots will be analysing England’s, and they will both be tweaking their patterns to confuse the opposition. Oh no, Scotland v England again. Pass my medicine. I wish I could change my shape so easily.